Nimbus School of Recording & Media is the elite music and media school located in beautiful Vancouver, BC, Canada. Nimbus offers small class sizes, mentorship from industry experts, hands-on training, and 24/7 access to our professional studios. Nimbus was co-founded by renowned music producers Bob Ezrin (Pink Floyd, Alice Cooper, Kiss) and GGGarth Richardson (Rage Against The Machine, Red Hot Chili Peppers, Biffy Clyro). All of our courses are taught by current industry professionals. We offer diploma and certificate programs in audio engineering, music production, electronic music production, video production, post-production & game audio, live sound, and music industry entrepreneurship. 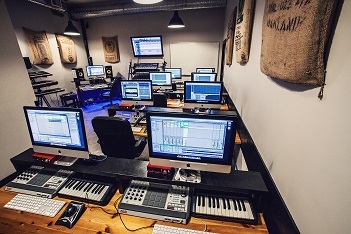 Nimbus helps students create their future in music and media. Through our reputation and involvement in the industry, we constantly receive opportunities for our alumni and current students. Our active placement program received over 200 job placement requests last year alone! Our alumni have gone on to do amazing things, including winning a Juno. Our advocacy for the music industry strives to strengthen the industry that our graduates go into. Nimbus exists to change lives through music. We are passionate about music, mentorship, and community. We value excellence and character. We are committed to creating a sense of belonging regardless of race, gender, orientation or religion to our students, alumni, staff and the larger community. We provide hands-on transfer of knowledge and life-skills from current industry professionals. Nimbus Advanced Music Industry students gain up-to-the-minute skills in the music industry as it is today. Students of the Advanced Music Industry program will promote albums and gain real, practical experience, including how to successfully run and manage a modern media business.